Although parakeets have their own personalities, they generally all exhibit similar behaviors when they're happy, and another set of behaviors when they're unhappy. An unhappy parakeet may also be ill, however, so it's important to keep a watchful eye. Happy parakeets sit side-by-side and preen each other. Parakeets are busy and curious by nature and need variety. If yours isn't climbing, chewing, flying or playing with his toys, give him something different to spark his interest. Include ropes to climb and chew, a swing, a bell and a ladder. Rotate his toys or try bringing him out of his cage to play to keep him from getting bored. Happy, healthy birds nibble throughout the day, often in between playtimes. Your parakeet should make frequent trips to his seeds or pellets, his water dish, and the veggies and fruits you provide. To stay healthy, he needs more than an all-seed diet. Give him small pieces of protein, such as chicken or egg, a variety of fresh fruit and dark, leafy greens, but avoid the pits, leaves and stems, which can be toxic. Experiment by serving them raw, cooked and shredded to see what yours prefers. Remove fresh food after one hour so it doesn't spoil. 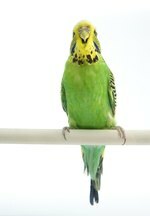 Chirping, singing, whistling and mimicking sounds are signs of a happy parakeet. While some say words and others chatter incoherently, vocalizing is an important part of their day. They may chirp along with the radio or sing on their own. As evening falls, happy parakeets soothe themselves by vocalizing a litany of sounds as if talking to their flock mates. Parakeets are sociable birds who crave interaction. A pair of birds will sing and play together and preen each other or scratch each other's heads. Sometimes a healthy bird will regurgitate food to its mate as a sign of affection. A single bird needs to interact with you. Wagging his tail, bobbing his head and poofing up his feathers for a few seconds mean he's happy to see you. If your pet bird shows signs of being unhappy, it's important to be sure he isn't ill. Due to their small size, a sick parakeet can succumb quickly. A poor appetite that doesn't respond to new and varied or favorite foods; a listless bird who stops playing and climbing; and one who isn't his usual chattering, singing self may be ill. It's always wise to be cautious and take him to an avian vet promptly.